Ever wanted to take a real world object and use it in a virtual environment? If you don’thave excellent modeling and texturing skills (I don’t), here’s something to test out. 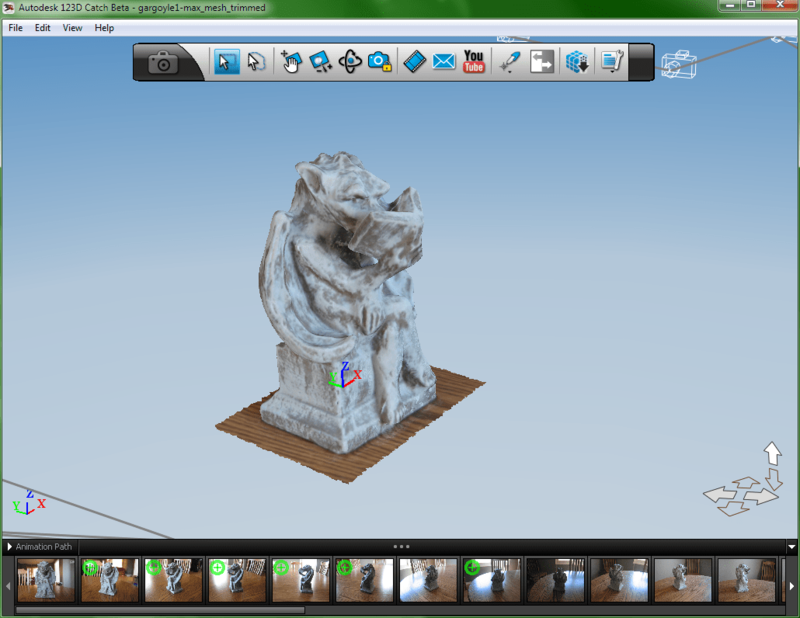 Autodesk has a family of free web apps called 123D. (Disclosure, I work for Autodesk. But not that part of Autodesk). They are meant to help people get assets into any virtual environment without spending months modeling. My favorite app in that family is 123D Catch. 123D Catch lets you create 3D models with just your point-and-shoot camera. Drop them into 123D Catch. The photos are uploaded to do some cloud-based number crunching to calculate your photo positions and to calculate the shape and texturing of your model. You can manually edit some points to polish the resulting model. The final model can be exported in FBX, for transfer into any 3D app – Max, Maya, etc. 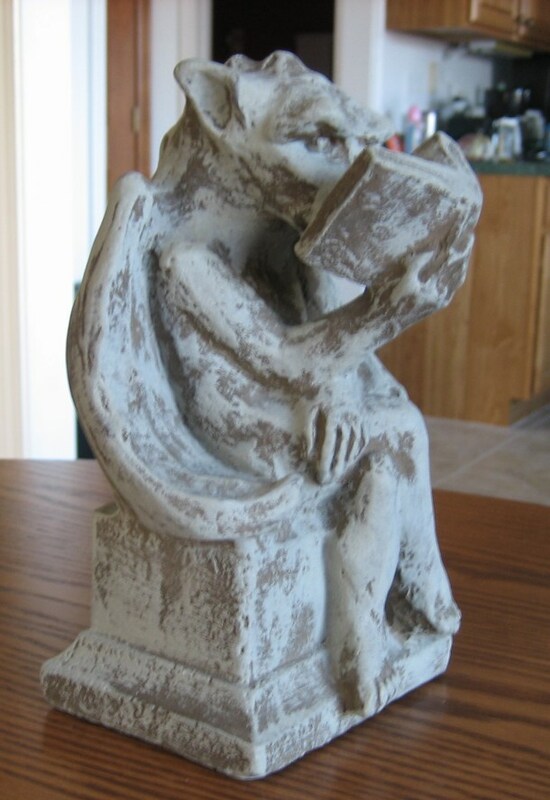 This was an experiment I did using 123D Catch at my house. I’m not the best photographer in the world, so a lot of my photos are blurry, or have back-lighting. I took about 40 photographs from different angles and heights. 123D Catch automatically calculated their positions, so I didn’t have to try to keep track of where I took the photos from. Once the photos were taken and uploaded, 123D Catch produced this model. I had to manually align some of the photos, but the tool included in the app is pretty easy to use if you have enough overlapping photos. It took around 10 minutes for 123D Catch to compute the model in the cloud, and about 10 more minutes for me to manually make some adjustments. Once I had finished, 123D Catch computes the updates to produce a final model. That final model can be exported through FBX into a wide number of 3D programs. 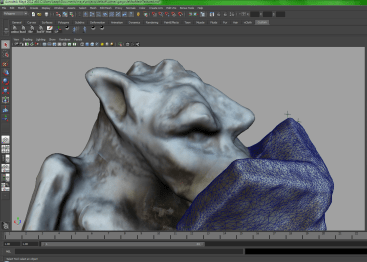 Here is a screenshot my gargoyle model inside of Maya. how did you get the textures into maya??? i am having not luck with this. only getting the mesh into maya. HELP!!! The jpg texture file should be in the zip file. Once you open the file, you will probably need to change the path in the texture node to point to the texture file’s location on your machine. I think I saved it with an absolute path, so it won’t be correct on your machine by default. Then open the Attribute Editor. In the Image Name box, click on the folder icon and assign it to where ever you’ve downloaded the jpg texture to. Is it possible to export to fbx from 123d catch ios version? I’ve never tried the ios version, unfortunately, so I don’t know. I would hope FBX export is implemented, because it’s really useful for multiple applications.